Summit Racing now carries Auto Meter American Muscle Instrument Clusters. Each cluster features a precision-molded dash panel that uses the factory mounting locations and hardware—no modifications required--plus a full set of Auto Meter's American Muscle gauges. 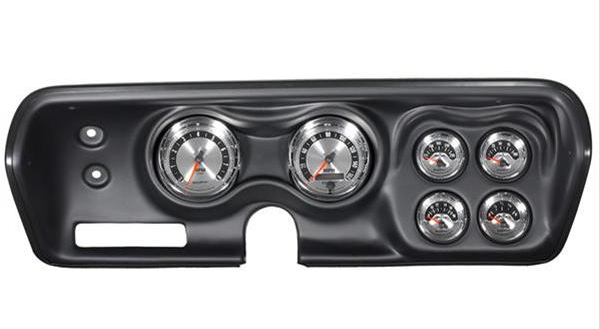 Summit Racing now carries Auto Meter American Muscle Instrument Clusters. Each cluster features a precision-molded dash panel that uses the factory mounting locations and hardware—no modifications required--plus a full set of Auto Meter's American Muscle gauges. What’s more, the included gauge wiring harness plugs into the factory instrument board. The American Muscle Instrument Clusters come with senders, LED lighting dimmer, and gauge mounting hardware.